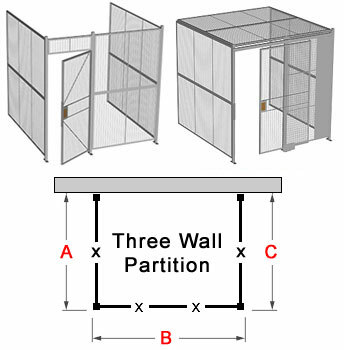 Three-Wall Partitions are designed to fit against a single building wall, providing a secure area utilizing one building walls and three wire mesh walls. WALLS: Your facility wall must be able to accommodate wall or ceiling panels to utilize a 3-sided partition without at-wall post connections. For assistance specifying your wire partition system, contact customer service toll-free. For quote assistance on a 3-wall partition, submit this easy-to-use Quote/Configuration form.